We think the Yellow Pages are useless and should go die already. But maybe not! 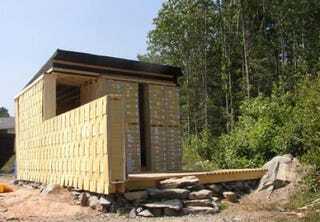 A resourceful architect managed to build a shed using just yellow pages. Perhaps those tree killing monstrosities can be reborn as paper bricks. There's about 7,000 phone books lining the walls of the shed and those pages of numbers actually make for a decent building block. The books form a ready made, insulated building module held in place with sheet metal angles normally used as drywall bead material. Once tensioned, the phone books form a stable wall into which additional layers can be easily screwed. The roof joists are also made of laminated phone books. The finished structure becomes a kind of time capsule, recording the names and numbers of community members.